Your basic everyday banana bread recipe. Otherwise known as, What to do with your ripened bananas. Optional: Add a handful of chopped walnuts or pecans. Preheat oven to 350°. Butter a 5×9 inch baking loaf pan. In a large bowl mash the bananas with the butter. Put the banana mixture into a blender. Add the milk, egg, vanilla, sugar, baking soda, salt and blend on a low speed until just mixed. Add the flour last and blend on low until just mixed. Do Not Over Blend! Small lumps are okay. Add the optional walnuts or pecans and blend until just mixed for a second or two. (The second time I made this I added a handful of dried whole organic cranberries.) Pour mixture into the loaf pan. Bake for 60 minutes. Cool on a rack, remove from pan and slice to serve. 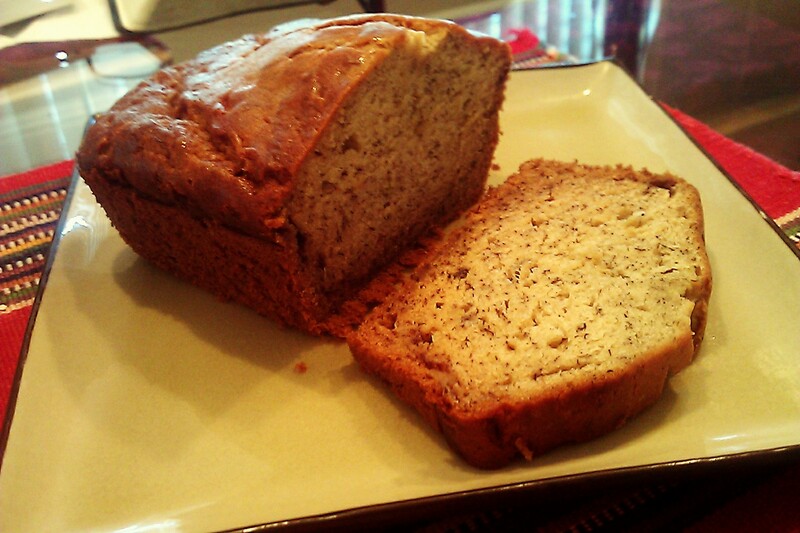 I love banana bread for breakfast – warmed up with butter on top. I haven’t made it in so long that I’m glad for the reminder. This loaf looks beautiful – really nice texture. Thanks, fist one ever! As a child I always ate peanut butter with fresh bananas so I spread some on a banana bread slice and it sure make for a delicious and filling snack. Thank you Andrea. The bananas I buy are ripening a lot faster this summer and this is a quick tasty solution. I just finished the last slice with my coffee this morning.